The uncertain fate of the ancient elms in Union Terrace Gardens is highlighted by Mike Shepherd. 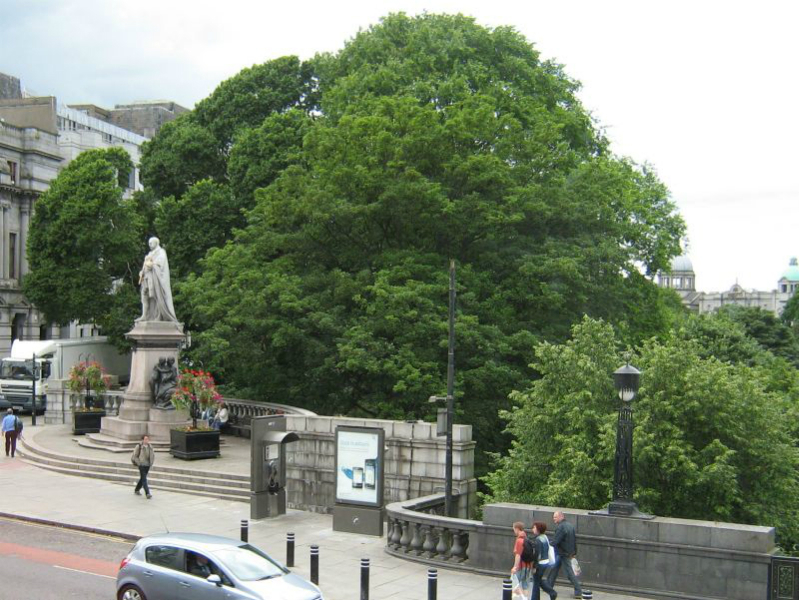 There are 77 mature trees in Union Terrace Gardens and a few more along the adjacent railway line. It is not clear how many of these will be felled during the construction of the proposed City Garden; however most will probably go. An Evening Express article suggested that they will all be removed, whilst it was mentioned at the January council meeting that some of the trees in the north-west corner may be kept. 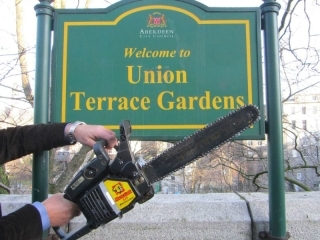 Rather bizarrely, the same Evening Express article mentions that the wood from the Union Terrace Gardens trees could be recycled for the construction of the City Garden, that is for paths and the wooden roof of the outdoor stage, “keeping them in the garden”. It is proposed that the new trees in the City Garden will comprise a “mini-forest” of 186 trees, mostly Scots Pines. The fate of the twelve elms in the park is a highly controversial issue. A handful of these trees are considered by the council to be at least 200 years old. They may be even older. A report gives mention to the planting by the Town Council in 1764 of a thick woodland on the hillside to the west of the Denburn. The trees in the park are disease-free. Occasional comments made by certain ill-informed councillors that Dutch Elm Disease is present in the Gardens are not true. The trees are inspected from time to time. The symptoms of the disease show up in the summer when leaves turn yellow and fall off early. This has not been seen in any of the Union Terrace Gardens elms. As far as mature trees in the city are concerned, the council can do what it wants. The disease, a fungus carried by bark beetles, has devastated elm trees throughout most of the UK. It is estimated that more than 25 million elms have been killed by the disease with very few mature trees left. The disease spread to the north of Scotland only in the last twenty years and pockets of relatively disease-free elms have survived here. Aberdeen city is one such pocket. The disease has been recorded in only a few trees in the west end of the city, but it is generally absent. Elsewhere in the north-east, Dutch Elm Disease has recently been killing large swathes of elms. Most, if not all, of the elm trees on Drum Castle Estate have succumbed, for example. It is to be hoped that the city stays relatively clear of the disease for as long as possible. “A tree preservation order (TPO) is an order made by us, giving legal protection to trees or woodland. A TPO prevents cutting down, uprooting, topping, lopping, wilful damage or destruction of trees (including cutting roots) without the council’s permission. In other words, as far as mature trees in the city are concerned, the council can do what it wants. A tree preservation order on the Union Terrace Gardens elms does not necessarily protect them. The result of the referendum on the Gardens in March will also decide the fate of the elms. For some in the city, it is a major issue. They see the removal of the trees in Union Terrace Gardens as a crime against nature. These are amongst the last surviving mature elms in the country, Europe even.